Zimbabwe’s ruling Zanu-PF party has summoned its MPs to discuss the future of its leader, President Robert Mugabe, after a deadline for his resignation came and went on Monday. The deadline was set by Mr Mugabe’s own party, Zanu-PF. The embattled leader surprised Zimbabweans on Sunday, declaring on TV that he planned to remain as president. Zanu-PF says it backs impeachment, and proceedings could begin as soon as Tuesday when parliament meets. In a draft motion seen by Reuters news agency, the party blamed the president for an “unprecedented economic tailspin”. Mr Mugabe’s grip on power has weakened considerably since the country’s army intervened last Wednesday in a row over who should succeed him. What did Mugabe say in his speech? During the 20-minute address, the president, who was flanked by generals, made no mention of the pressure from his party and the public to quit. Instead, he declared that the military had done nothing wrong by seizing power and placing him under house arrest. “Whatever the pros and cons of how they [the army] went about their operation, I, as commander-in-chief, do acknowledge their concerns,” he said, in reference to the army’s move last week to take over the state broadcaster in the capital Harare. He also said “the [Zanu-PF] party congress is due in a few weeks and I will preside over its processes”. Before Mr Mugabe’s speech, Mr Mnangagwa was named as Zanu-PF’s new leader and candidate for the 2018 general elections, while Mr Mugabe’s wife was expelled. BBC Africa Editor Fergal Keane said his understanding was that Mr Mugabe had agreed to resign, but then changed his mind. Our correspondent says the generals have no intention of forcing Mr Mugabe out by the barrel of a gun, and are happy to let the Zanu-PF carry out its procedures, working through impeachment if necessary. HARARE- Zimbabwean President Robert Mugabe has until noon (1000 GMT) on Monday to stand down or the ruling ZANU-PF will begin impeachment proceedings after the 93-year-old leader defied expectations he would resign. Zimbabwe’s liberation war veterans, who have been among the most vocal in calling for Mugabe’s resignation, will hold a media briefing at 9.30 a.m. Moments after Mugabe’s address, war veterans leader Chris Mutsvangwa told Reuters they would lead public protests in the streets of Harare, cranking up the pressure on Zimbabwe’s ruler of the last 37 years. Having been sacked by his party, Mugabe has run out of options but appears to be steadfastly clinging to the very last vestiges of power. There was even speculation that he read the wrong speech in his live television address, or skipped over passages about standing down. Anxious Zimbabweans have been trying to decipher a barely audible aside comment he made to military chief Constantino Chiwenga at the end of the address. 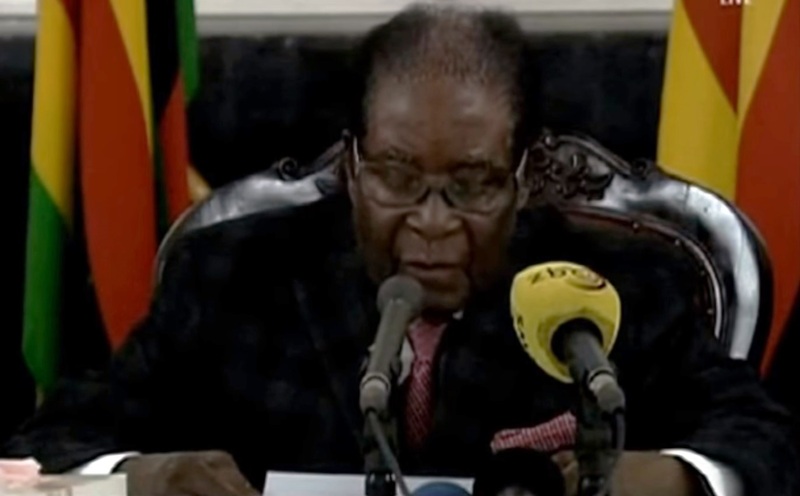 In the audio, which is not clear, Mugabe refers to a “long speech” or a “wrong speech”. ZANU-PF’s central committee had earlier named Emmerson Mnangagwa as its new leader. It was Mugabe’s sacking of Mnangagwa as his vice-president – paving the way for his wife Grace to succeed him – that triggered the army to seize control on Wednesday. On Saturday, hundreds of thousands took to the streets of the capital Harare to celebrate Mugabe’s expected downfall and hail a new era for their country. The huge crowds in Harare have given a quasi-democratic veneer to the army’s intervention, backing its assertion that it was merely effecting a constitutional transfer of power, rather than a plain coup, which would risk a diplomatic backlash. CNN reports: Zimbabwe’s long-time president Robert Mugabe has agreed to the terms of his resignation and a letter has been drafted, an official source with direct knowledge of negotiations told CNN. The source said that the generals had given into many of Mugabe’s demands including full immunity for himself and his wife Grace, and that he would keep his private properties. Nov 19, 2017 -Zimbabwe’s Robert Mugabe goes on national TV and vows to stay on as president, despite pressure for him to resign.